As a woman working in the male-dominated world of hip-hop, I often feel frustrated. I tend to be treated more like a groupie or a mother than like an intelligent professional. I was flattered and rather surprised - it hadn’t occurred to me that others would be inspired by what I often call “drowning in a sea of men,” just trying to stay afloat, much less make progress, in a masculine industry. 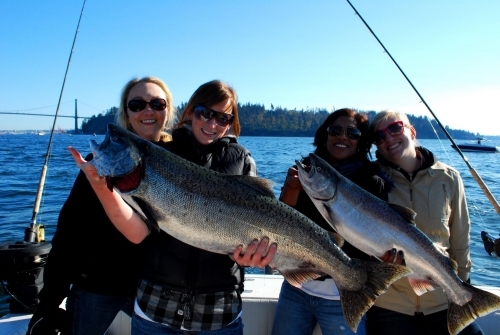 Vicki invited me to join her and two Albertan friends on a girls’ week-end fishing trip in Vancouver. 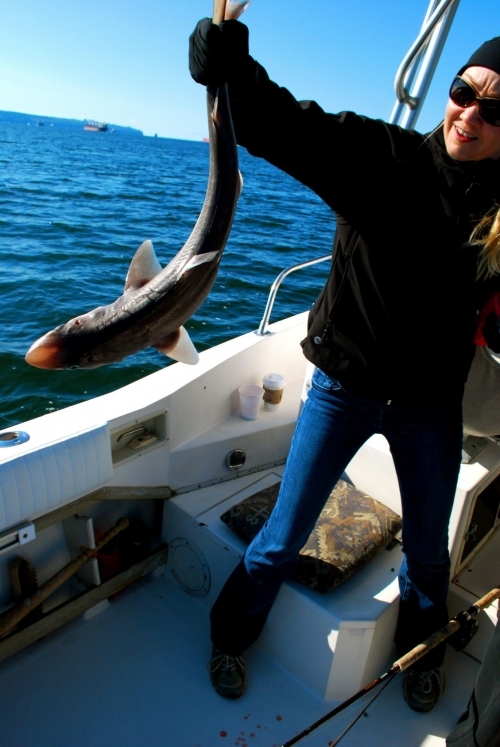 Always looking for a new experience – I’ve never fished – I decided to take the plunge, so to speak. I met Vicki, Tammy and Jess at the dock. They were friendly and hospitable, and as the boat moved into the deeper waters, we made easy conversation. Our fishing guide, Jason, was also pleasant, and seemed rather glad to have a crew of ladies on board – he’d even cleaned the toilet especially for us. During our five hours on the water, I learned a few lessons on how to navigate through the murky waters of fish, and to stay afloat in a man’s domain. 1. You need something to ground you. When you’re deep sea fishing, you’re trolling a hundred feet down. Jason used something called a sinker, a round little cannonball that sunk to the depths, because without a weight you just kind of float around aimlessly. As the girls and I chatted, revealing our guilty pleasures, our complaints about men and our love of expensive shoes that we never wear, I realized that women need each other to stay grounded. We need to remind each other who we are, for we are not men and if we try to act like men we lose something of what makes us so special. 2. It helps to have a guide. Through Jason's extensive experience he always knew right away if was a jellyfish, a shark, or a salmon on the line. Sure, we could have probably figured it out – Jess has fished and is a hunting guide in Northern Alberta – but it would have taken us a while and cut into our wine and cookie time. Jason was very gracious, and patiently showed us the ropes. It’s a great comfort to have someone who’s competent in their field share their expertise. Mentors are important, and in a man’s world, a man can be very helpful in providing directions. 3. “It’s a frickin’ mind game,” exclaimed Vicki as we all stood with our eyes glued to the rods, waiting for them to bounce with catch. Like a watched kettle that never boils, it seemed that those damn fish were never gonna come. You can put on a flasher, you can change the bait and you can watch the poles obsessively, but you can’t make ‘em bite. So we relaxed instead. We drank our share of “Fish Eye” wine, smoked those cigarettes we were trying not to, and sunned ourselves in the BC rays. And we caught several fish, although we probably would never have even noticed the bites if not for Jason running across the boat yelling, “bite, bite!” There’s no point being too anxious about getting ahead, especially as women who internalize so much and feel things so strongly. Feel the good feelings strongly, let the other stuff come as it may. 4. Some of this stuff is counter-intuitive. 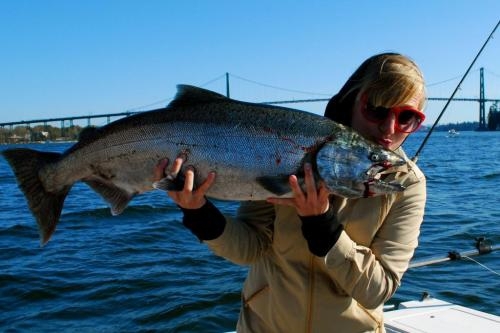 Tammy was wondering why the fish she was reeling in never got any closer, when Jess pointed out to her that she was reeling it in the wrong way. “But I’m reeling towards me,” she said with confusion: in fishing you gotta turn the reel in the opposite direction. For many women, our intuitions tell us to care and nurture, but that often goes awry in the world of business. Like the cute seal that followed our boat around for hours, lurking to steal our catch, many people out there will take advantage. We need thick skins and stern voices in order to protect our softer sides. 5. 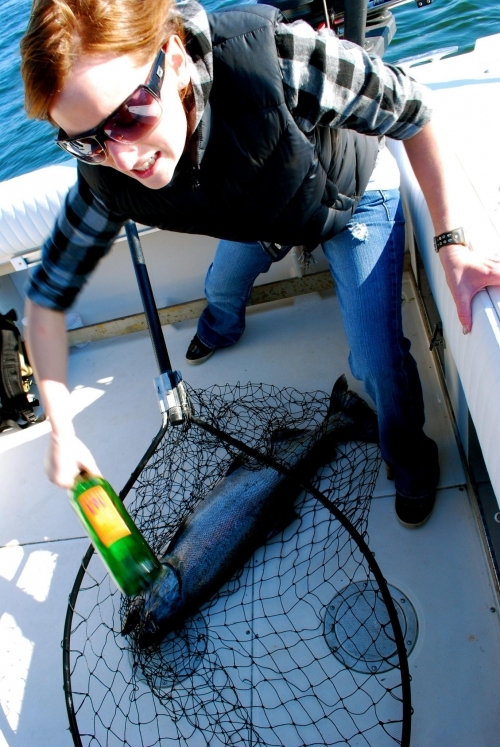 “When he wants to pull, let him pull,” Jason reminded us whenever a salmon was on the line. You give him slack when he needs it or he’ll snap the line: reel him in when he’s not fighting. Sometimes we just want everything right away, and force seems to be the way to get it. Fish are comfortable in their underwater world, and although we want them to meet us on our terms, they’re gonna do it their way. So we work with that, and when he wants to pull, we just need to let him pull. By the end of the five hour trip I knew a lot more about my companions. I saw vast strength, a huge capacity for love and laughter, and a couple of insecurities. I knew a lot more about fishing, too, and was surprised at how much I’d learned about men just by going through what is typically a very manly process. Of course, I’m not sure where the knocking-the-fish-on-the-head-till-he-stops-squirming analogy comes in, but that remains to be seen.